This section is updated as warranted. Responsible Newsdesk Editor: Trond S. Trondsen. Please submit updates to newsdesk@nostalghia.com. The latest news update from Les Amis de l'Institut Andreï Tarkovski, Paris is found here in English and here in French [PDF]. The letter explains that the upcoming The Sacrifice DVD will include an interview with Erland Josephson and a documentary, Le Dernier film by Michal Leszczylowski. The letter also includes details on the upcoming special events in connection with the 20th anniversary of Tarkovsky's death [ poster ]. 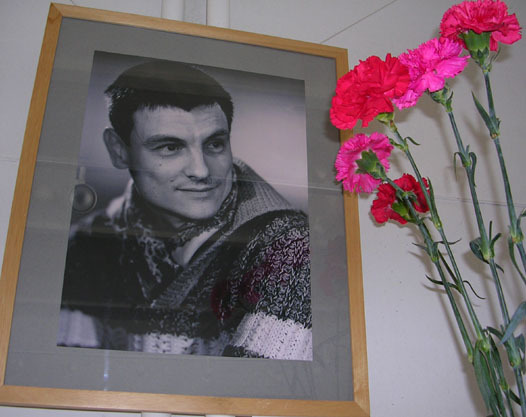 The Tarkovsky Institute membership application form is found here. Laura Geronazzo of Ultreya informs us that Andrei Tarkovsky's Instant Light will soon be avilable again, this time in paperback editions from Thames & Hudson, London, as well as Thames & Hudson, New York. The latter will distribute the book in the US, Canada, and Australia. The release is planned for the spring of 2006. This will be the first time the book is published in North America. The ISBN codes are UK 0-500-28614-0 and USA 0-500-28614-0 52495. An exhibition of the Polaroids will open in Florence on January 19th, lasting until February 19th 2006, at the Archivio Storico del Comune di Firenze, Italy. Miloš Fryš of the Czech Republic informs us that his new book, a collection of short texts on Tarkovsky — in the works now for more than two years — is slated for a November 30 release. The book, written in the Czech language, is entitled Beauty as a Symbol of Truth (Krása je symbolem pravdy). The collection of essays is personally selected and edited by Miloš Fryš, who also translated most of the material into Czech. (Some of our readers may already be aware of his Czech translation of Robert Bresson's Notes on the Cinematographer, listed on our Bresson site). The new book is published on his own publishing house, Camera obscura, with the support of a grant from the Czech Ministry of Culture. Petr Gajdošík of our sister site Nostalghia.cz contributed extensively to the final section of the book, which provides one of the most complete overviews we have ever seen in print of "all things Tarkovsky", i.e., filmographies, documentaries, DVDs and DVD bonus materials, radio plays, theatre plays, soundtracks, books, articles, artwork, homages, and so on. Miloš has kindly provided us with a copy of his book, along with an English-language summary of the book's contents. Though not illustrated, this is a very handsome 450-page tome, printed on excellent quality paper, with a sturdy, first-class hardcover binding, replete with integrated silk ribbon for bookmarking purposes. We notice that the assistance of both Nostalghia.cz and Nostalghia.com are prominently acknowledged in the Special Thanks section. This book is very clearly a labour of love, and it occupies a place of pride on our already extensive bookshelf. We here at Nostalghia.com wish to congratulate Miloš Fryš on a job well done. In connection with the book's publication, there will be a ceremony held at the Prague Film Club Cinema Aero, Biskupcova Street 31, Prague 3, on November 30 at 8:30 pm. The Killers and The Passion According to Andrei will screen during the event. DVDBeaver has updated his Mirror comparison review to include the recent Lizard release, here. We are currently preparing a discussion of some of the fascinating (and often startling) differences between the Polish version of the Tarkovsky Diaries and the recently released French édition définitive version. Stay tuned. Arte, France, will be releasing a 2xDVD set of Le Sacrifice, with Chris Marker's One Day in the Life of Andrei Arsenevitch and Michal Lesczylowski's Directed by Andrei Tarkovsky as bonus materials. The disc set is slated for a November 23 release. The format is PAL, Region 2, no English subtitles. Available from amazon.fr and fnac.com. for the remainder of the film though sound only gets a little better. selection design and number of chapter stops (11) is identical to A.E. edition is the most accurate at the moment." hello, i recently received both of these titles. while i've not had a chance to look at "the sacrifice" in any detail, i can warn that (at least on my copy) "nostalghia" the audio is not good. it has a distracting amount of background hiss, numerous pops and other artifacts. was the original audio like this? [The magnetic tracks have been lost and all DVD editions are based on the same noisy analogue audio track. —Editors]. while the image itself is progressive and anamorphic (1.66), this audio problem is truly distracting. unfortunately, at least according to the box, the print of "the sacrifice" is also 1.66, but NOT anamorphic. both have also been converted to stereo. these are legit – the packing is quite nice and notes are extensive. it's just a shame they couldn't have put some care into fixing up the sound on "nostalghia". DVDBeaver provides comparison reviews of both the Sacrifice and Nostalghia discs. Our friends in the Czech Republic report that Alexei Alexeievitch Solonitsyn, brother of actor Anatoly Solonitsyn (Andrei Rublev) was in Prague on October 19 and 20. 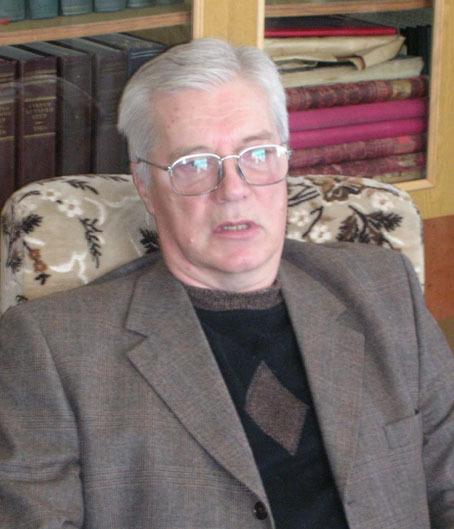 Mr. Solonitsyn is a Russian writer, philosopher, and also a filmmaker. While in Prague, he presented a short film as well as some of his books. See photo on nostalghia.cz, here, in their Oct. 14 update. Someone has pointed out to us the remarkable similarity between track #5 (Dukhovskaya/Song for Whitsuntide) on the CD The Russian Seasons (Nonesuch, 2003) and the folk song featured in Nostalghia. Interesting. The Seaward 14th Chichester Film Festival, West Sussex, England, will include a screening of the films of Tarkovsky (August 27 to September 10). Full details here. Thanks to Wayne Spencer and Matthew Platts for notifying us. The Anthology Film Archives, New York, will be screening Mirror, The Sacrifice, Ivan's Childhood, Andrei Rublev, and Solaris during the period August 5 – 6. More details here. Also note that Sergei Paradjanov's Color of Pomegranates and Shadows of Our Forgotten Ancestors are being screened on August 10th. Information on the premiere performance of Kimmo Hakola's Le Sacrifice by the Finnish Radio Symphony Orchestra under conductor Sakari Oramo is found here. Thanks to Jani Pirisjoki for the heads-up. In connection with the recent Mk2 DVD releases, Francis Moury provides capsule reviews of Miroir, Solaris, and Stalker. As well, there is another article by Thorsten Botz-Bornstein here. All in French. A comparison between the now out-of-print Fox Lorber Nostalghia DVD and the RusCiCo release is found here. The RusCiCo disc is clearly inferior to the already unacceptable Fox Lorber disc (which now sells for $72 to $200 used, on Amazon.com). We're not quite sure what exactly this is, but we'll let you know as soon as we find out. Enterone is a legit company that releases major Korean movies, so we have no reason to believe that it is a bootleg (as opposed to this inferior release, also Korean). Enterone is also releasing The Sacrifice. Cameo, Spain, will be releasing a deluxe 3xDVD-set of The Sacrifice, according to this leaked information. We'll provide you with further details once we're permitted to. The latest news update from Les Amis de l'Institut Andreï Tarkovski, Paris is found here (French, PDF). Note that members can purchase the Mk2 Ivan's Childhood for as little as 15 Euros — detailed ordering information is given in the attached letter. In our previous update, we provided a link to Francis Moury's review of the Mk2 Ivan's Childhood DVD. He has also written a more "technical" review, and a link to that review is found here. (Links to reviews of the other Mk2 discs are also found on this page, but these other discs are direct ports of the already well-known RusCiCo releases). Almost all of Tarkovsky's films will be screened in Rotterdam, The Netherlands, this summer. A program listing is found here. Thanks to Jacob Dijkstra for the update. The Irish Film Institute will be screening the following films as part of their Tarkovsky Season in July and August. Thanks to Hameed Chughtai for this update. The recent Mk2 Ivan's Childhood DVD is reviewed by Francis Moury, here. RusCiCo informs us that all Ivan's Childhood DVDs produced after April 2005, starting with the Mk2 release, contain the remastered version of the film (see recent news items). This includes any re-pressings of the edition available directly from RusCiCo: these will appear when their current inventory of the old version is...uh, sold out. The Njuta Films, Moskwood, Artificial Eye, etc., versions will presumably remain of unacceptable quality unless these entities have enough insight into the situation to request of RusCiCo a new Master tape. 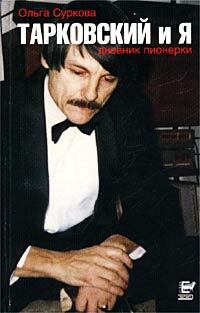 Gary's conclusion is: "I have done the comparisons for every MK2 Tarkovsky DVD. They are all exact RusCiCo ports, but Ivan's Childhood is from a newer RusCiCo [transfer] and looks marvelous. Definitely worth purchase...". 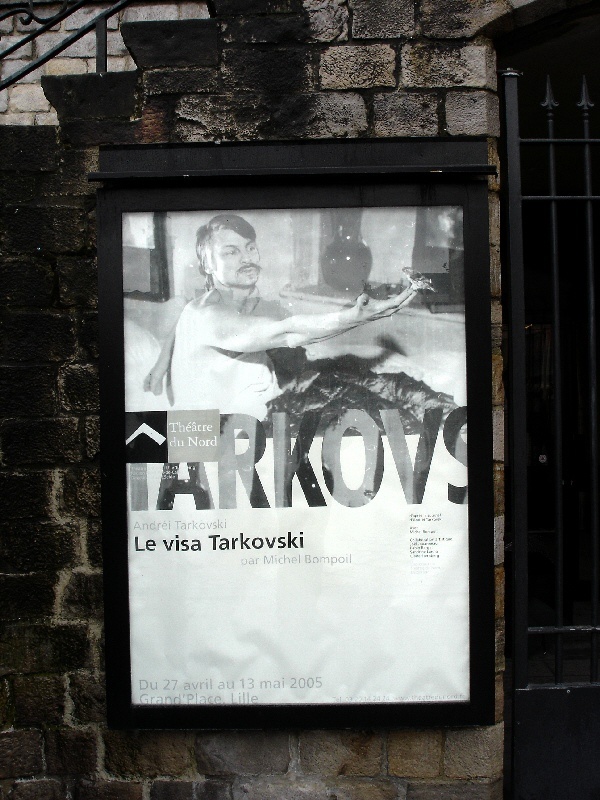 Les Amis de l'Institut Andreï Tarkovski, Paris, reports that on May 25, the MK2 Parnasse commenced an Andrei Tarkovsky retrospective. The new RusCiCo/MK2 Ivan's Childhood DVD is a "must-have" for Tarkovsky collectors (see previous news item), and members of the Les Amis may be pleased to hear that they can purchase this DVD for a mere 15 Euros. See the latest news update from the Les Amis for additional details. This newsletter also announces their upcoming June 12th meeting during which there will be, among other things, a screening of Moscow, After Tarkovsky, a 30-minute 1994 interview by Charles H. de Brantes with Alexander Kaïdanovski. Thorsten Botz-Bornstein informs us that a long version of his earlier article on Tarkovsky's "aesthetics of the strange" is now on-line, here. Cuore di Silenzio/Heart of Silence (also described as "the story of the real Andrei Rublev, told by Mr. Zanni, Comico dell'Arte") is currently playing in London at the Barons Court/Curtain's Up Theatre. The play — dedicated to Andrei Tarkovsky and freely inspired by his film — features Gino Paccagnella from Bologna and the performances continue until 8 May. Antonella Mottin who sent us this information adds: "This is a unique opportunity to listen from Mr. Zanni himself the real story of Andrei Rublev, in a very special Commedia dell'Arte style". Read more about it here. Childhood (9th-10th), Stalker (11th-12th) and Mirror (25th-26th). The American Film Institute, Silver Spring, Maryland, will be screening The Complete Feature Films of Andrei Tarkovsky, April 16 through Saturday, April 30. Details here. The Théâtre du Nord, located in Lille in Northern France, is staging the play Le visa Tarkovski by Michel Bompoli from April 27 to May 13, 2005. As mentioned before, the play is based on Tarkovsky's diaries. Andrey Tarkovski Jr. will be participating in a press conference which will take place on April 27, prior to the premiere of the play. Moreover, a retrospective of Tarkovsky's films will be shown at the Majestic — situated in Lille city centre — around the same time as the play (details to be announced). Thanks to Isabelle Demeyere and William Miller for information on these exciting events. Isabelle sent a press kit and William sent a photo he took in Lille yesterday. It would appear that our fears were justified: the upcoming MK2 Tarkovsky DVDs are merely repackaged versions of the infernal RusCiCo discs which have already been available with French subtitles (for example via Artificial Eye) for a long time. The boutique.mk2.com even shamelessly list the soundtrack as "Dolby Digital 5.1", so the prudent Tarkovsky aficionado may want to avoid these discs. Thanks to Juan Asensio and Wayne Spencer for helping us confirm these facts. Les Amis de l'Institut Andreï Tarkovski met in Paris on March 20 for their annual General Assembly meeting (as announced in our March 1 news update). They sent us this meeting summary and update on future events (in English, PDF format). The Les Amis membership-form is found here (French, PDF). Please consider signing up as a support member (we did!). The exhibit of Andrei Tarkovsky's Polaroids will be in Padua (north-east Italy) from 6 May to 5 June and in Capalbio (central Italy) from 10 June and well into July. It should find itself back in Florence by September or October. See our March 1 and March 7 updates for more information. A BFI touring programme of Tarkovsky films is being shown in a number of cinemas across Britain from April 1. Details can be found here. Speaking of the Bresson site, many of our readers may find this interview to be of some interest. Tarkovsky is mentioned frequently during this conversation between filmmakers Jonathan Hourigan and Tim Cawkwell. April 4th was what would have been Andrei's 73rd birthday. Our correspondent Eugene Borzov in Ivanovo sent us the following report. the place where Andrey Tarkovsky 73 years ago. Solonitsin (who starred in most of Tarkovsky's films). but not until now in his native language (cover scan). Thank you for your wonderful site again! We're usually more than happy to plug honest, hard-working artists whenever there is some Tarkovsky connection. We recently received a nice letter from Ilai Rämä of the Finnish band Kirlian Crossing. He says: "The original goal of our music making was to combine Nick Drake type of folk songs into Soviet Union era science fiction in Tarkovsky spirit. That was the starting point, but we went little wrong. Maybe we get there on the next album." Check out the mp3 files on their website. The Moscow Film Museum is still in danger of being converted into a strip-bar (see our March 1 update) — follow the latest developments here. 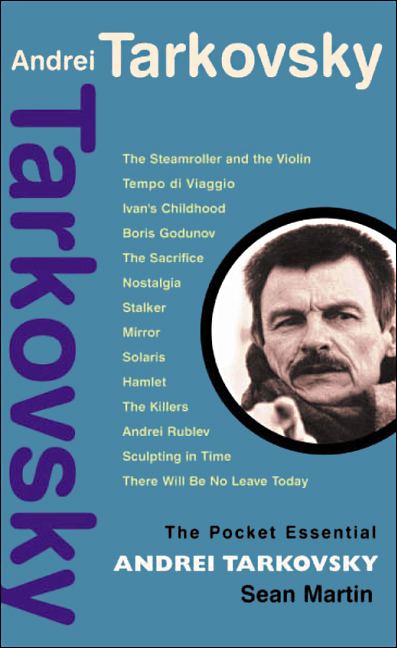 Artificial Eye are finally advertising (in the latest NFT programme) their Andrei Tarkovsky Companion DVD, which we first hinted about in our February 6, 2003 news update. The title is slated for a "late Spring 2005" release. The release will include Chris Marker's One Day in the Life of Andrei Arsenevitch, Alexander Sokurov's Moscow Elegy, Tarkovsky's Tempo di Viaggio (with the corrected subtitles), and possibly another not-yet-confirmed title. In our January 25 news item we mentioned Olga Surkova and her two Russian books: Tarkovskii i ya (published in 2002) and the new S Tarkovskim i o Tarkovskom (published in 2005). Both are currently being translated to English by Kirill Galetski who sent us this small teaser from Tarkovskii i ya (called Tarkovsky vs. Tarkovsky in English). The books are quite different from one another and form a complementary and insightful "double portrait" of the artist. The publishers' notes can be found on our bibliography page. As a quick reminder, Ms. Surkova will be presenting her new book at a Paris book fair (which includes an expanded Russian section) on March 22 from 7–8 pm, at Salon du Livre, Hall 1, Paris expo, Metro station: Porte de Versailles. Stalker (also in a new print) will begin on 11 March. Office or by calling 020 7928 3232. Two quick errata concerning foreign editions of Tarkovsky's books mentioned in the previous news item. The Italian edition of Instant Light is not the only one currently in print — two more language versions are available. One is the French edition Lumière instantanée, published in November 2004 by Éditions Philippe Rey. It is still available at fnac. The French Amazon seems to be "actuellement indisponible" (or more to the point, "en rupture de stock"). 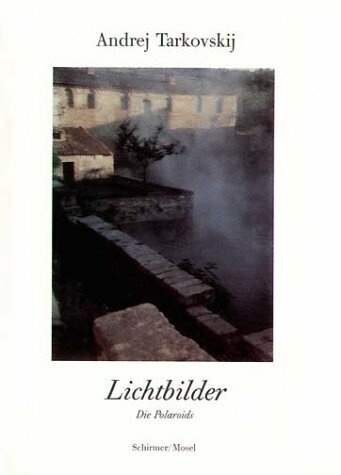 Another version is the German edition Lichtbilder, published in May 2004 by Schirmer/Mosel Verlag. It can be found e.g. on the German Amazon site. The text from these books is available in English via links on this page. 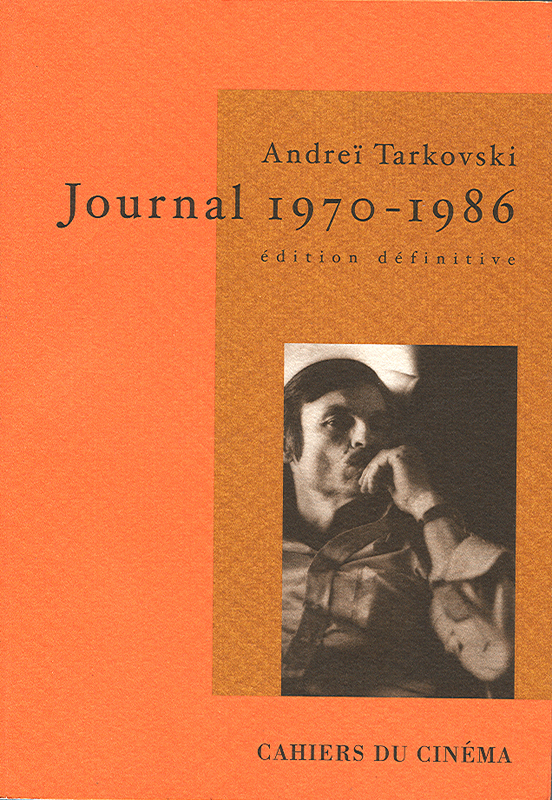 In our second mea culpa we'd like to note that our news of the imminent French publication of Tarkovsky's diaries was several months out of date, as the book Journal 1970–1986. Édition définitive has been published last November by Cahiers du Cinéma. It is available both at fnac and Amazon.fr. 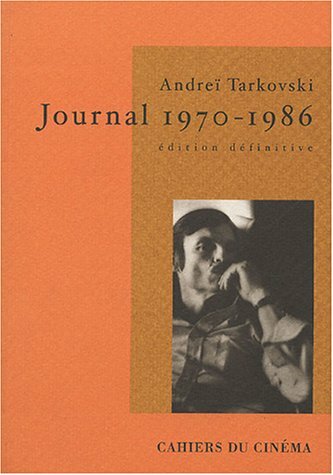 It is also worth mentioning that Récits de jeunesse — the latest discovery by the Tarkovski Institute of some unknown writings by the young Tarkovsky — has been published in November, also by Éditions Philippe Rey in Paris, see for example here (note the wrong cover scan) and here. Les Amis de l'Institut Andreï Tarkovski is meeting in Paris on March 20 for their annual General Assembly meeting. All are invited. Upcoming activities of the Tarkovsky Institute (Paris, Florence, Moscow) will be announced at the meeting. Bruno Girard and Laurent Mesguich will present theoretical reflections on Stalker and The Sacrifice, respectively. Additional details are found here [PDF file, English]. An exhibit of Andrei Tarkovsky's Polaroids opened last Friday at the Museo Cantonale d'Arte in Lugano, Switzerland: Luce istantanea, Fotografie 1979–1984 (we thank Laura Geronazzo of Ultreya for this information). According to the Italian PDF booklet hidden within Museo Cantonale's somewhat Flash-heavy web site, the exhibit has been organised by Giovanni Chiaramonte and Andrei Andreievich Tarkovsky with the collaboration of Ultreya, Milano, and the Andrei Tarkovsky Foundation in Florence, Paris, and Moscow. The exhibit remains open until 3 April. On a related yet sour note: Thames and Hudson inform us that the English translation of the book (Instant Light) has gone out of print and there are currently no plans to reprint it. Unfortunately, no US edition is planned either, thanks in part to the abysmal dollar-to-euro exchange rate. The book has thus joined some other (to us) indispensable works, such as Le Fanu's The Cinema of Andrei Tarkovsky, David Bordwell's Ozu and the Poetics of Cinema, and Keiko McDonald's Mizoguchi, in obscurity and availability only very rarely through such channels as eBay or Abebooks, at exorbitant prices. As for Instant Light, we therefore recommend the original Italian edition which is still available e.g., at the Internet Bookshop Italia. 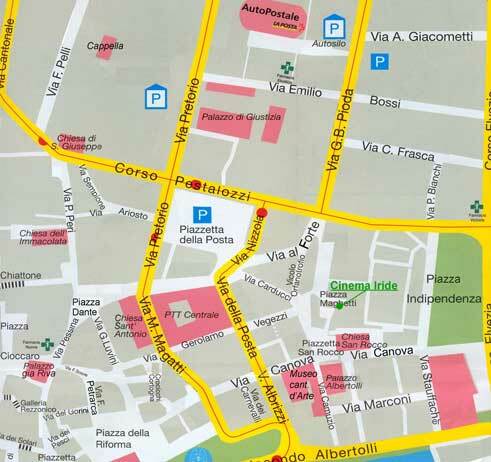 The Italian text from the book is available in English via links on this page. The French translation of Tarkovsky's complete diaries on the other hand appears to be nearing publication. Currently the Italian translation Martirologio is the only complete version. We'll keep you posted on further details and the publication date in France. 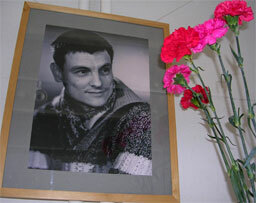 Tarkovsky enthusiast Malcolm Smith's personal guide to the London, England NFT Tarkovsky festival may be viewed here. We at Nostalghia.com wish the BFI/NFT great success — may the turnout be tremendous! We conclude with a sad bit of news from Moscow. The Moscow Film Museum has been ordered to vacate its rooms immediately. You can read more about this absurd story here. Thus ends the saga begun a few years ago, see this note for example. The articles do not mention what plans the new owner has for the building, although Google search reveals the following (are you sitting down? 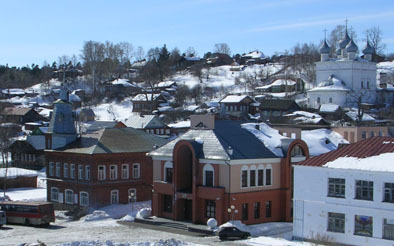 ): Casino Arlekino, a strip-bar, and a sauna. It's hard to imagine a more symbolic sign of times for cultural priorities in Russia today. We have just published an (in our opinion) important essay by Robert Bird, Gazing into Time: Tarkovsky and Post-Modern Cinema Aesthetics. Among the works he touches upon are Vida Johnson and Graham Petrie's The Films of Andrei Tarkovsky: A Visual Fugue, Igor Evlampiev's Andrei Tarkovsky's Artistic Philosophy, and James Macgillivray's Andrei Tarkovsky's 'Madonna del Parto'. Our mini-reviews of the Facets NTSC DVD releases of Alexander Sokurov's Spiritual Voices and Confession are found here. The discs come highly recommended. The Metro Cinema in Edmonton, Alberta, Canada, will be screening The Sacrifice to accompany local film maker Aaron Munson's short-film fixation on Thursday, March 3, at 19:00. Thanks to Kyle Armstrong – also a local filmmaker – for the tip. Further to our previous news item on the Nujta Films, Sweden, RusCiCo DVDs: Ivan's Childhood, Stalker and The Mirror include original mono soundtracks. This is not the case for Andrej Rubljov and Solaris. (As far as we know, no current RusCiCo edition of the latter two films includes a mono soundtrack.) Many thanks to Jouko Isosomppi and Nicolas Debot for the information. The NFT have put full details of their Tarkovsky season in March on their website. Thanks to Aidan King of Cornwall for the tip. Our colleagues over at Senses of Cinema have published their review of Instant Light: Tarkovsky Polaroids. Thanks to Wayne Spencer for letting us know. We have received preview DVDs of Facets Video's upcoming NTSC/Region 1 releases of Alexander Sokurov's Spiritual Voices and Confession. We will bring you our reviews shortly. In the meantime, read Mr. Sokurov's own introduction. The National Film Theatre, London, England, are screening Solaris February 18–28. Further details here. Thanks to Wayne Spencer for the update! Note that a complete Tarkovsky retrospective will be held at the NFT in February/March (please, somebody, send us a hardcopy of the film programme for our archives...). There is a new book out, by Olga Surkova. 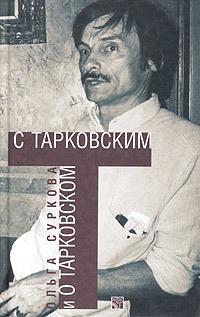 The title is S Tarkovskim i o Tarkovskom (With Tarkovsky and On Tarkovsky). 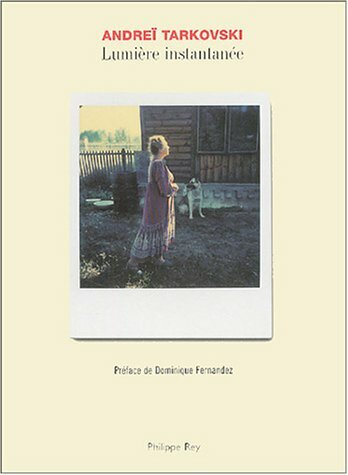 The publisher's blurb reads, roughly translated into English, "unique material is contained in this book by film historian Olga Surkova, a long-standing and devoted researcher of the works by Andrei Tarkovsky with whom she shared friendship for many years. Interviews as well as transcripts of diaries and audio tapes included in the book immerse the reader in the creative world of the great director, allowing participation in the filmmaking process, providing verbal formulations – rather than cinematographic ones – of Tarkovsky's views on art, the artist, and the viewer." Published by Raduga, 2005 Hard cover, 464 pp. ISBN 5-05-006018-4. Circulation: 3,000. Olga Surkova will be presenting her new book at a Paris book fair (which includes an expanded Russian section) on March 22 from 7–8 pm, at Salon du Livre, Hall 1, Paris expo, Metro station: Porte de Versailles. This book is a follow-up to Ms. Surkova's earlier book Tarkovskiy i ya. Dnevnik pionerki (Tarkovsky and I — Diary of a Girl Scout) [ cover ]. Neither book is currently available in English. The good news is that both books are in the process of being translated. However, no publisher has yet been found. We invite our readers to help remedy this situation: please read this letter from the translator, Kirill Galetski. Independent DVD distributors Njuta Films, Sweden (check out their large press photos), and Moskwood Media, The Netherlands, are both issuing RusCiCo Tarkovsky titles in their respective countries. No word yet on whether or not some or all of these titles include the original (mono) soundtrack. According to Kino, the American Cinematheque at the Egyptian Theatre in Hollywood will be showing "Three Films By Andrei Tarkovsky" January 27–29: Andrei Rublov (205 min) on Thursday, January 27 at 7:30 pm and Saturday, January 29 at 7:30 pm, Solaris on Friday, January 28 at 7:30 pm, and Mirror on Saturday, January 29 at 5:00 pm. Also, American Cinematheque at the Aero Theatre in Santa Monica will be screening Mirror on February 10, Solaris on February 11, and Andrei Rublov on February 13. 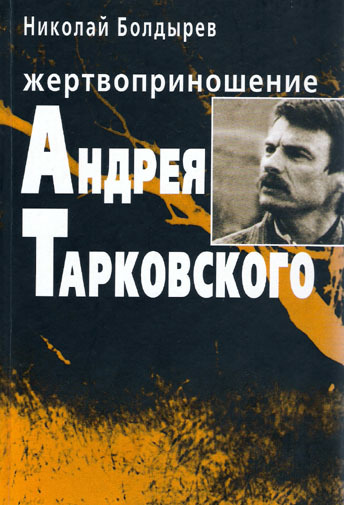 The journal Russian Studies in Literature recently published a paper called Andrei Tarkovsky as Reader of Arsenii Tarkovsky's Poetry in the Film Mirror. Copyright is the property of M.E. Sharpe Inc.; the article may be downloaded and printed for individual use only. Thanks to Wayne Spencer for notifying us of this paper. Juan Asensio [ website ] discusses the two recent Philippe Rey [ed.] books (see our December 6 news item), here. While digging through our archives, we ran across some professionally recorded audio tapes from the set of Sacrifice. We extracted two brief clips for you, which demonstrate how Andrei Tarkovsky instructed his cast, how he responded to their questions, how he changed parts of the the script on the fly, and the dynamic manner in which the team was able to work through their translator, with virtually real-time Swedish-Russian-English translation [ clip 1 | clip 2 ]. We received the following letter from The Netherlands. From    : Stegeman, mw. J.E. museum for contemporary art in Breda, Netherlands. 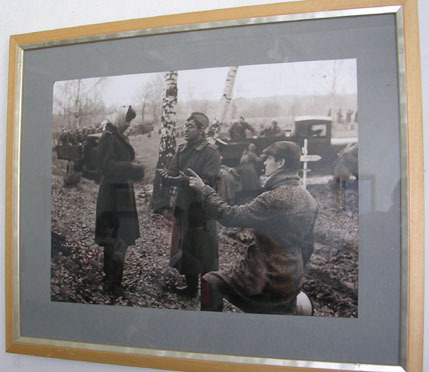 The exhibition lasts till Feb. 13, 2005. Attached: poster | exhibition concept | list of artists.